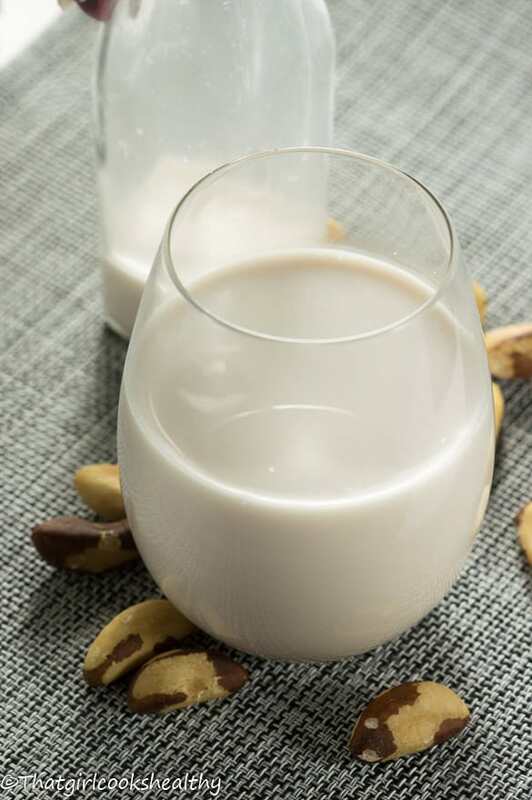 Brazil nut milk recipe – Whether you’re lactose intolerant or leading a vegan lifestyle try this alternative plant based nut milk. It’s been quite some time since I last made a nut milk recipe. I know to some people these “how to” recipes aren’t as exciting as the main entree or even my dessert dishes BUT……I strongly believe that you can benefit from learning how to make these seemingly tedious recipes. I’ve been lactose intolerant for a number of years now and it’s not fun trying to dodge and weave through life looking for dairy alternatives. My mother gave me this huge bag of mixed nuts – walnut, brazil and almonds which I was really grateful for. While the aforementioned are my favourite nut combination, they are also very costly too. My initial thoughts were to make a dairy free cheesecake similar to this raw chocolate cheese with an almond biscuit base and on seconds I decided to make a basic nut milk recipe, after all it’s been quite some time, don’t you think? Furthermore, while coconut milk is cheap and cheerful compared to the other nut milks – pistachio, almond etc.. I was beginning to grow bored of making my smoothies with coconut milk and so welcome any newest additional to the nut milk family – brazil nut milk. 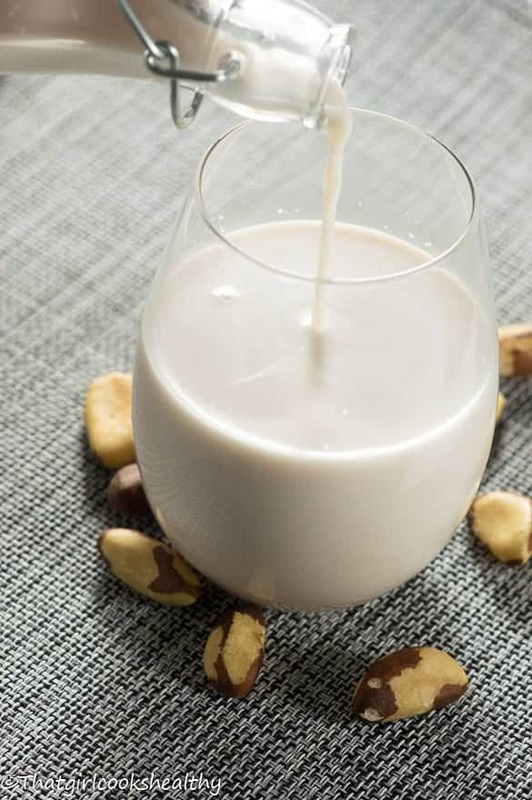 Brazil nut milk is extremely similar to cashew milk in texture, it’s consistency is creamy so much so that you don’t even need to use a emulsifier to omit separation. Also, like most of the other nuts they contain a high dose of vitamin e that is great of skin elasticity, promotes smooth skin and helps to heal scars. Another positive thing to note about brazil nuts are the good fats known as mono-unsaturated fats (namely palmitolec and oleic acid which has been known to lower the bad cholesterol (LDL) and instead increase the good fat that our circulatory system needs (HDL). A good example of where mono-unsaturated fats are utilised is the Mediterranean diet where plant based foods are primarily eaten in tandem with healthy fats sourced from nuts and oils. Add all of the ingredients (excluding the pink salt and vanilla) to a high speed blender and whiz for a minute or until a smooth consistency is present. Prepare a large jug with a cheesecloth over the top and begin to pour the nut milk into the cheesecloth. Squeeze the excess bits of milk out of the pulp that is compressed into the cheesecloth. Feel free to add the pulp to your smoothies, as not to waste anything. Remove the cheesecloth and then stir in the vanilla along with the pink salt. I’ve never though to make brazil nut milk before, Awesome idea! I love your blog! Charla, this is such an important post! My adult son is lactose intolerant, and I’ll try to remember to forward it along to him… Also, your photos are gorgeous. Bravo! Thanks Tamara, yes please do share this with him and feel free to browse my other gluten free nut milks. I really need to try making my own nut milk. Bintu, you definitely should I promise you will like it. I really enjoyed this post. I’m vegetarian and I use store bought almond, rice or coconut milk a preference over dairy milk due to concerns of ingredients. I would prefer to make my own milk, which I will do as soon as I get a new blender. Do you have any recommendations for a good blender…. Thank you kindly. May God continue to bless you in all your endeavors. Hi Judith, thank you for commenting. 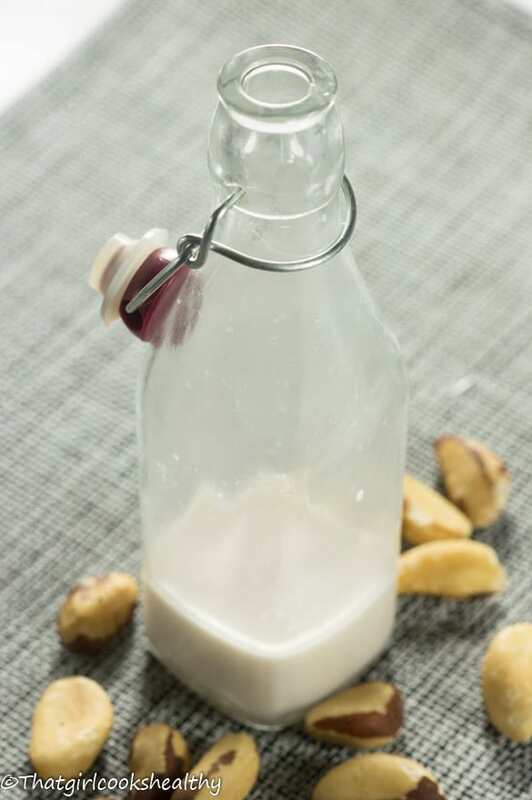 Yes you will notice the difference once you make your own nut milk. It’s a lot of fresher plus you know exactly what ingredients go into it since you’re in complete control. In regards to a good blender I would highly recommend a Vitamix, that is what I use for all of my recipes. It’s quite expensive (depending on your budget) but they have a 7 year warranty. I couldn’t live without mine I use it every single day. I’m just visiting. I originally got here by looking for a date paste recipes. Anyway. I just wanted to share those who want a vita mix machine should check out QVC. They give you a payment plan vs anyone else I know. I’ve had mine for 4 years after wanting one so bad years prior. QVC gave me that chance. To the subject. What does this milk taste like. I am curious. I did make my own almond milk the first moment I received my machine, have not since and forgot the taste.. I’ve bought store bought and not sure they are honest to making it at home.. Thanks for commenting. Brazil nut milk is quite nutty, at least bland but with the additional of the vanilla this brings out the flavour. I have never tried Brazil nuts but this sounds sooo good!! Saving this recipe! Thanks!! So I’ve been meaning to try my hand at homemade nut milks, and funny enough I have brazil nuts on hand! I thought I bought hazelnuts but realized today they were brazil nuts. I just need to get some cheese cloth now. Thanks for sharing! That’s awesome Ashley. I strongly suggest putting those brazil nuts to good use and make some nut milk. Did you soak the raw Brazil nuts as part of the prep process? I really liked reading your article. Thank you. Yes soak them in water warm for an hour or overnight if you wish. 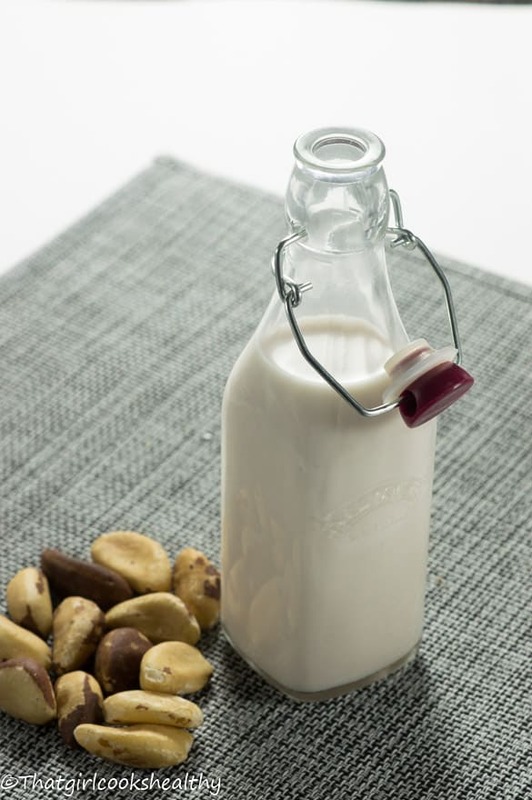 I decided to give your Brazil nut milk recipe a try last night…I think that it’s now my fave nut milk! My favourites had been cashew nut milk followed by hemp milk – just in case you were wondering. Hi Ceil. Thank you so much for your constant feedback, it makes me believe in what I do. I’m evening thinking of creating videos to supplement my written tutorials. Hi Charlene! I’m new to your blog and I had Brazil nuts soaking since yesterday. I made the milk this morning. It’s delicious. I substituted organic deglet noor dates; because that’s all I had 😉 for medgool dates. I put the milk in my tea this morning and it was great!! Thanks for the recipe. My daughter loves spiced Brazil nut milk (made @ a local vegan restaurant). I’m going to put my spin on it w/your milk recipe. Hi Shae. Thank you soooooo much for your feedback. 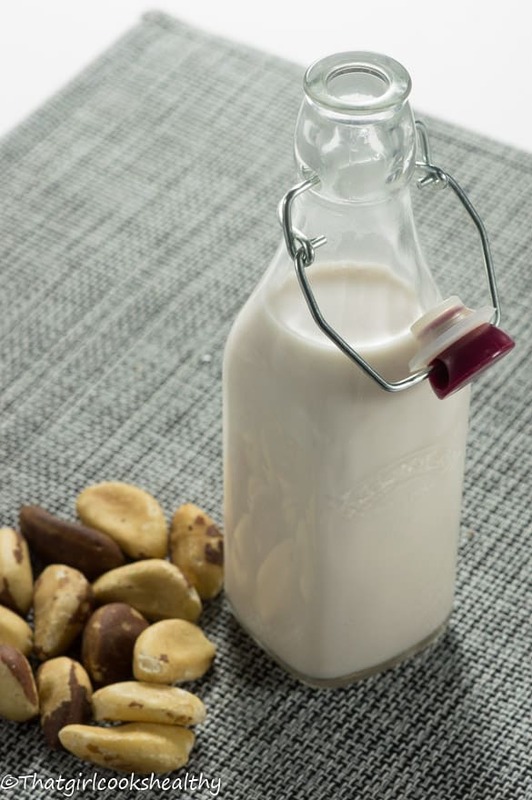 Spiced Brazil nut milk sounds amazing, will have to try that one too. Enjoy! I came across your site when doing a Google search on making Brazil nut milk. I made your recipe today, it was my first time making a nut milk. It is absolutely delicious and very easy to make. Thank you!